I finally got some new material in the mail that has informed and inspired me. I mentioned before that I’m a member of the British Traction Engine Trust. They have a considerable list of publications in each issue of Steaming Magazine. After I rejoined last fall, I went hog wild and ordered some $75 worth of publications. One of those is called The European Traction Engine Register 4th edition. We could argue with the name a bit since a great majority of the steam engines listed are portables, rollers and steam fire engines…But why quibble? It was compiled by David Afitt, Derek Rayner and John Toy and inspired by the Traction Engine Register that covers British collections. In their introduction, they summarize there are some 2,900 entries covering 280 makes, 570 museums and 37 countries. The authors took license in their layout with an expanded list of abbreviations and symbols that make the reader look up details rather often, even if we are familiar with steam power. If you have read any of the American catalogs which are widely reprinted, you may have noticed that many of the companies talk at length about exports. I was rather surprised, though, to see many American traction engines listed and at least 25 Stanley Steam Cars, plus some American Steam Cars that I did not recognize. Also, there were about eight Locomobile Steam Cars which, as you may know, were only built for some three years from 1899-1901. As one might in such an endeavor, some data is incomplete, especially dates. Many domestic makes consume most pages, especially French and Swedish. Munktells lists 142 portables and five traction engines in the section on Sweden. I’ll go country by country below and highlight especially the American listings. As we also would expect, many British engines have found their way to the continent and several Canadian engines. I would not say the book is lavishly illustrated but there are quite a few pictures and the quality is high. One eye-catcher is a full page shot of a 1910 Aultman Taylor traction engine at the Museum in Istanbul. Overleaf from that is a picture of a French Gardner — Serpollet steam race car which has the operator sitting quite high and in the open on top of a streamlined body. Several of the Garener-Serpollet cars are listed also. The first country is Austria, where we find a 1909 Case 18 HP traction engine, three Fowler Rollers from England, three Lanz portables out of Germany, a 1900 Locomobile car and a 1922 Stanley model 73. Belgium is next with two Buffalo-Pitts traction engines of 1882 and 1893, a Buffalo-Springfield Roller of an unknown date, a 1922 Frick portable, a 1917 Garr-Scott Traction, 1903 Geiser traction, a Huber traction no date, a 1900 Locomobile and 1900 Milwaukee steam car, 1926 Port Huron traction, 1903 Reeves Traction of 13 HP, an 1899 Skene steam car, six Stanley’s from 1908-1921 and a Toledo steam car. Bulgaria shows a 13 HP Garr Scott traction engine of unknown date. For Czech Republic is a 1913 Case 60 HP traction engine, one of the Garnder-Serpollet cars, a Locomobile car from 1902, a Stanley of unknown date and a 1904 White steam car. Next is a list of 22 Smekal Czech-built steam fire engines, 1892 to 1912. Denmark lists a 1902 Conrad Steam car, three Stanleys, 1919, 1919 and 1921, and a Canadian Waterloo traction of 1903. Four Museums are in Denmark. Alphabetically next is Estonia. No American engines listed, but a number of portable engines from Britain and Germany and four museums. Finland has a 1915 Geiser/EB traction Type TT. Next page made me stop and wind my watch where it lists two Phoenix traction engines from the U.S.A.
Aultman Phoenix engines are very scarce but these are both listed as 100 brake horsepower. The index in the back of the book shows them as coming from Eau Clare, Wisconsin, so, they are Phoenix log tractors. I wonder how much we used them in the Finnish Forests and what shape they are in. Next page lists 42 portables made in Finland and 18 museums in Finland. France was one country that had industry of its own, so the first page of their section lists some 24 Rollers by Aillot and Albaret. Page two shows, among others, a Canadian Robert Bell traction with no date, and finishes with five Case listed as 40 HP, 50 HP, 30 HP and a 20 HP portable with a note that the second unit was converted to diesel. Only the first has a date and it is 1914. Part way down the next page is listed Cugnot’s “Steam Dray” of 1770, the second steam vehicle ever built in the world, held by a museum in Paris. The next page starts with nine of The Gardner-Serpollet domestic Steam Cars. Further is a Harrison Machine Works portable from the USA — no data — and on the next page another Locomobile car — no date. Page 23 shows a Milwaukee steam car from 1900, a 20 HP Minneapolis traction and two Nichols and Shepard, a traction showing as 16-60 HP and a portable with no data. Page 28 shows a 1918 Port Huron traction of 19-65 size then a list of domestics followed by four Stanleys, 1906 model H, 1910 Model 60, 1921 and 1922 — both Model 735. The last page lists a Waterloo Canadian traction engine with no other data and a 1909 White car model O. France lists some 43 Museums. The Germany section starts with 36 semi-portables and one portable by domestic firm Assmann & Stockder. Page 33 shows a Buffalo-Pitts traction and a 1922 Case Traction 65 HP size and a portable with no data. On page 36, among mostly domestic and some British engines, is a 1924 Keck Gonnerman traction, no size listed. Page 37 lists a full half page of Lanz domestic portables and semi-portables, followed by another page and a half of the same with a couple tractions thrown into the mix. Page 31 shows a 1901 Locomobile listed as a four horse. Page 40 shows two steam cars that are new to me — a 1900 Mobile and a Reading Steamer of 1903. 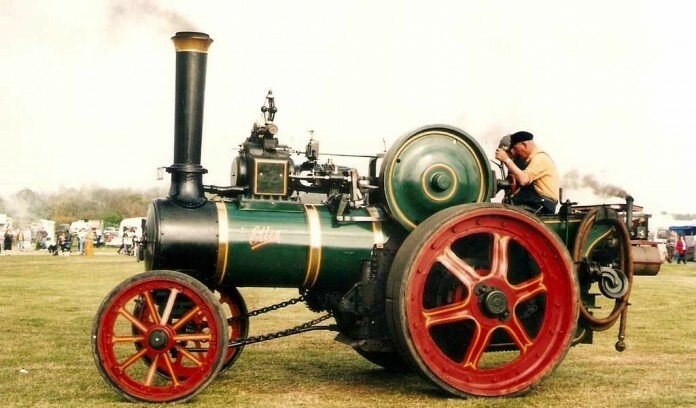 Further on is a Rumley traction engine with no data. The next page shows seven Stanley’s from 1902-1924, various models followed down the page by a Waltham steam car and then a White Model OO of 1910. Following those is a page and a half of domestic Wolf engines of portable and semi-portable configuration. Lastly, we find some 64 museums listed. Greece comes next with a mix of British and German engines but nothing American. In the Hungary listings, we find a 50 Case with no other data, then on page 47 three traction engines, a Minneapolis and a Port Huron with no data, and a Russell of 1920. Then a list of seven museums, three of which are shown in Budapest. Iceland’s lone entry is a 1912 Aveling and Porter Roller which is, of course, British. Italy has a very widely mixed presentation starting with two advance traction engines out of Michigan but no data. Two advance Rumleys are next, a 20 and a 25 HP, but no dates, and a 22 HP American Abell from Canada. Various domestic and British engines fill the next couple pages, then on page 50 are four Case engines, a 1904 twenty horse traction, a 1912 40 horse and another traction with no numbers and a portable of 30 HP. Ten or so lines down are two Farquhar Portables with no data, then, at mid-page a 1923 Frick Portable listed as 48 HP and a Garr-Scott traction with no numbers. Next page includes a 16 HP Huber from 1906 and a 1934 Keck Gonnerman at 19 HP. Page 52 shows two 1900 Locomobile steam cars then a list of Marshall’s from Britain, starting at 1887. Page 53 shows a Nichols and Shepard 20-70 HP and another 19-65Port Huron traction, and an assortment of other engines. Then an odd one — a 1902 Reeves shown as being converted to a crawler using part of the boiler from a Breda RR engine. I wonder what that looks like? Page 54 is topped by a 25 horse Rumley and 1916 Russell of 12 HP. Half way down on pg 55 my eye stopped on a Tozer Portable built in Columbia, South Carolina at 12 HP. I saw a very similar engine at the museum in Wetaskewin, Alberta, Canada when they hosted the summer show of HCEA a few years ago. Further down are a George White Canadian traction of 1907 and another White Steam car, model OO of 1910. A list of 18 museums closes out the Italian material. On page 56, Kosovo lists five portables, nothing American. Latvia finishes page 56 with a mixture of equipment and finishes on page 58 with three portables and a fire engine, then a list of four museums. Liechtenstein is also on page 58, with a 1911 Stanley Steamer, Model 62. Lithuania has 11 entries, one of which includes a 1921 Port Huron Portable, and three museums. Luxembourg shows eight entries, one of which is a 1915 Cae 65 HP. Three museums finish the listing. Malta is next with three Marshall portables. The Netherlands material starts with an Advance Rumley Traction — no data — and a 1908 American LaFrance steam Fire engine. Page 61 lists four tractions from Case, 1910, 1914, and two 1909s, and two portables with no data. Page 62 includes a 1911 Kelly-Springfield tandem roller and a 1903 Locomobile. The next page has a 1911 Minneapolis traction of 18 HP and a very nice photo of a British Merryweather vertical-boilered fire engine. Page 65 shows four Canadian Sawyer-Massey traction engines, 1905-1919 at 13 HP and two at 20-60 HP, and further down no less than eight Stanley cars from 1906 1923 in various models. The last page includes a 1912 Waterous roller from Canada and a 1904 Canadian George White traction, followed by three identical 1904 White cars, all model D 10 HP, then a list of seven Netherlands museums. Norway’s listing is a bit short and contains but one American machine, a Buffalo-Springfield roller with no data, but noted as a convertible to traction engine form. Most of the rest are portables followed by eight museums. The listings for Poland cover several pages and include a 1913 Frick traction, a Goodison Canadian traction with no data, and another Stanley Car, then a George White traction from 1910. The Portugal listing has nothing American on two full pages but finishes with five Museums. The only interesting item for Romania is another Gardner-Serpollet car from 1895 and four museums. Russia shows a Canadian Rober Bell portable noted as being converted from a Traction engine, then an American Clapp and Jones Steam Fire engine, and about a dozen miscellaneous engines and five museums. Serbia items cover about a page with no American machines and three Museums. Slovakia’s entries include a 1922 Stanley model 740 and again three Museums. Slovenia has but half a page, nothing American and two Museums. Spain’s listings are a bit more extensive and include an American-Abell with no data, a 1910 Case 60 HP traction, an Iroquois tandem roller, an 1899 Locomobile car, two Russell traction engines with no details, two Stanleys — a 1910 model 60 and 1911 model 63 — and nine museums. Sweden is a much more extensive section, some six pages and listing 21 museums. American machinery includes a 1919 Advance-Rumley traction of 20 HP, a 1909 Avery traction of 30 HP. Next, we see three Case traction engines: 1903 six HP, 1904 nine HP, and 1914 40 HP. Then Farquhar of 1900, a forty horse portable. Next American unit is a Clark portable with no data. Where is this one from? The index of engines says Mexico, New York, and my atlas shows that east of the Lake, north of Syracuse. Page 87 lists some 37 Ludwigsberg Swedish built Steam Fire engines with the note that many of them are in the custody of the local fire brigades. Next we have a Mobile steam car from the USA. The index shows an origin in Tarrytown, New York. The next three pages are filled with Swedish-built “Munktells” Engines. 142 Portables and five Traction. Next American entry is a Nichols Steam Fire engine that the index shows is from Burlington, Vermont. Then a 1918 Nichols and Shepard traction of 20-70 HP. Middle of the next page (91) lists four more Stanleys, a 1903, 1907 Model ET, 1924 Model 740 and one more with no data. Lastly, for Sweden, we find two Westinghouse traction engines, both 1913, a 15 HP and a 12 HP — both in Gotene, probably in a museum. Switzerland starts off with 21 Aveling and Porter British rollers then a 1900 Locomobile steam car Style 2. Two Stanleys, 1902 Model A and 1905 model E, and a Whitney Car, Style B. Finishing with 26 German built Zettelmeyer Rollers and 7 museums. The only domestic built machines are an 1891 Sulzer semi-portable and an 1877 Steam car called Thury-Nussberger and three rollers, a steam tricycle and a semi-portabe engine by Schweizerische Locomotive and Maschinenfabrik. Turkey shows the 1910 Aultman-Taylor traction with a beautiful picture of a fine restoration mentioned above, 20 HP and a Nichols and Shepard traction with no data, and an 1898 Malden car. All these are listed in Istanbul, so we presume they are held at the museum called Rahmi. M. Koc. The final country listed is Ukraine with a Kemna (German) ploughing engine and three portables with no data and one museum.